Thanks for the reminder @Ron Nasty i've had a busy week. I'm very glad Friday is here. 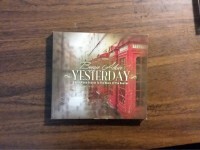 How nice to hear WSC is listening to some Beatles and solo songs again! No one can escape the fab four's magic, it seems. One could probably include nearly every George song though, I guess. YEEEEEYYYY WSC has his best band back! Also if you want to tack this on to the email, here are the many instances I heard Beatles songs in public. On Wednesday when we went to Wendy's for lucnh I heard Paul's "Coming Up ", and then a couple songs later I heard "Twist And Shout ". Then we went to this antique store and they had a CD of Beatles songs on solo piano playing in the store. Since it's just piano music, the CD is approved, so I bought it. On Thursday at the salvation army I heard "Let It Be " when we walked in, "Penny Lane " while we were working, and "Hey Jude " when we were on our way out. On Friday I heard "I Saw Her Standing There " at Walmart. Ah, The Beatles will find you. That is most bizarre! 4 Beatley moments in 3 days! (Well, you should expect those sort of things if you're a Beatles fan. @sir walter raleigh, you have posted the bit that WSC wanted tacked onto this week's email, but you haven't posted this week's email. It's week 4 in the field. It seems like just yesterday I was typing up week 6's weekly. You all should keep sending me emails. I know your lives might not seem that exciting, but it's really exciting to me to see what you all are up to at home. Monday: On Sunday night we stayed at the apartment of the zone leaders with a few of the other Gillette elders. My MTC companion was there with his companion. In the morning we hung out while we waited for everyone to take a shower, then we headed to the Church to play basketball and email home. We hung out there till about 3. My companion and I were going on exchanges with the Zone Leaders. My companion was going with the zone leader from Las Vegas and was staying in Gillette, and I was going with the other zone leader and heading back to Sheridan. Since I was the Elder actually in the Sheridan area, I got to be the driver while on exchanges, and the first place I got to drive after not driving for 7 to 8 weeks was the 85 mph highway. It took me a bit to gain my bearings while driving seeing as I was also in a larger vehicle than I'm used to driving, but all was good. We made it to Sheridan with no scratches. Tuesday: The other Zone leader and I went around and checked up on some people that I put on a list of people we need to check up on. We didn't have too much success there. Dinner was originally canceled because the dad was gonna be out hunting, but the family was gonna have us pick up dinner at 6. Well we ended our search for people a bit early, but I decided to head over to pick up the dinner early and then wait and plan the night's lesson in the car till they came, since they wouldn't be home till about six. We arrived at about 5:25, and at 5:30 the dad showed up. In the end we had dinner at their house just like the original plan. The world works in mysterious ways. I doubt this was a coincidence. The lesson that night was with that young couple that we taught last Tuesday. It went pretty well. We were able to teach them about the restoration and answer some of their questions. Wednesday: The morning was a district meeting. My companion came back and we ended exchanges. In the evening we taught the restoration to a girl who's friends with this girl from the YSA ward. It went pretty well. She seemed to understand everything. Thursday: Service day. As usual we did some service at the salvation army and the food bank. We had 2 lessons planned for the evening but they both fell through. Friday: Today we had a interviews with President. They were at 8:40 in the morning so we had to get ready to leave a little earlier than ususal. Then we were able to teach the lady that we've taught the past 2 Fridays again, and we gave our new member(the one that got baptized last week) his first post baptism lesson. Saturday: We drove up to Gillette for stake conference and then went to the evening session. Sunday: We went to the Sunday session of stake conference. Then we had dinner at this member's house in Gillette. Then we had a lesson with a couple of the Gillette elders. That's all for this week. I hope you all are doing well. I love you all very much. So far as his comment about emails is concerned, as he explained to me, so far as the forum goes, if anyone wants to write something directly to him - which he would like - their news, things they'd like him to know, thoughts they want to share, PM them to either sir walter or myself, and we will pass on your complete messages rather than summarise comments made in this thread. No problem Ron Nasty. Thanks backing me up. Been pretty busy nowadays. It's getting a little chilly up here, but I'm enjoying it. I'd take this over 120 F in the summers any day. Monday: We just spent the day hanging out in Gillette. Companion and I headed back to Sheridan to go to dinner and the YSA activity, where we played pictionary. Tuesday: We were able to go visit and investigator we haven't seen in a while to see how he's doing. We were gonna bake cookies for him, but our oven kind of doesn't work at all. We were supposed to bake them for 10 minutes at 350 F, but the knob on our oven doesn't like to turn to certain teperatures, so we put it at 225 F and within 3 minutes the cookies were burnt. So instead we gave him a pie that we had in the fridge. Wednesday: We had district meeting. The zone leaders were there because they were in the area. They were the ones that gave the dicussions. One of the dicussions was on not putting ourselves into boxes and putting limits on ourselves. The other one was about empathy and trying to understand people. After that we were able to teach an investigator about the Plan of Salvation with her friend present. Thursday: We skipped doing service at the salvation army to go dedicate a grave. It was quite a powerful experience. After that we did service at the food bank. In the evening we went to this thing called Third Thursday. It's this carnival type thing that happens every third Thursday in the summer months (June-September). We were able to see the young couple we've taught the past couple Tuesdays perform. They were playing and singing in the live band that was there. Friday: We were able to teach the investigator we have been teaching for the past few Fridays again and commit her to come to church on Sunday. In the evening we were able to visit an investigator at his buisiness. He owns a frame shop where he makes an sells frames for art and various other things. Saturday: We were finally able to play Ultimate Frisbee with the young men. It seems every week since I've got here, there's been something on Saturday preventing Ultimate Frisbee. After that we tried to go and visit a few people we haven't talked to in a while. Sunday: We went to church. In the first ward we went to they had a double homecoming for two missionaries that just returned home. The second ward we went to had a primary program where all the little kids get up and sing. Then we had dinner with this family. We have dinner with them every Sunday. We were able to talk with and teach their innactive son a bit. It was pretty fun. Anyway, that is it for this week. I hope you all had a great week. I love each and everyone of you. Keep the emails coming. I absolutely love hearing about life back home. There was no Beatles songs heard in public places this week...sadly. Monday: This gal from the YSA ward had a birthday today, so we went to lunch with her and went around to the shops around town to browse them. It was pretty fun. Then we drove to Buffalo to meet the zone leaders to do another exchange. It was the same as last time. Me and the zone leader not from veags in Sheridan and My companion and the zone leader from veags in Gillette. I also won a hammer. On Third Thursday I entered to win a hammer because it was free, and I got a call saying that I was the winner. We weren't able to pick it up though because of the birthday celebrations. Tuesday: I was the driver again due to us being on exchanges. My driving skillz are coming back slowly. We did service for some people out in story. The YSA girl we are teaching and her member friend were able to pick up my hammer for me at the college which was awesome! It came with a bonus tape measure. We also had another lesson with the young couple we usually teach on Tuesday where we answered a lot of their questions and put to rest some of their doubts. Wednesday: We met on Buffalo in the morning to switch back companipons, then we went to district meeting. I gave a discussion on using members in missionary work. Then we gave our recent convert another post baptism lesson. Thursday: We did service at the Salvation Army and the Food Bank as usual. Then at night we did another lesson with the two girls that picked up my hammer. The non member is going to conference with her friend and her friend's family, which is super exciting. Friday: We celebrated the 1 year anniversary or "friendaversary" of with those two girls during our lunch period. They have been super excited about this for a while. We gave them gifts that we were able to pick up at the Salvation Army, and they loved them. They got each other gifts, but they also got us gifts. They got me a Beatles Tshirt and they gave Elder Muhlestien some Ninja Turtle socks. We had a lesson with the lady that I found that we've been teaching every friday, and then in the evening in we headed down to Gillette for conference weekend. Saturday: We were able to watch the Saturday session of conference. It was really powerful. We had a lot of great talks, and a lot of important topics were brought up. Sudnay: Transfers came in. I'm staying in sheridan, but my companion/trainor is out. He is being replaced by a new elder who will finish my training. We watched the rest of conference. The mission president's wife asked us to write down questions before conference and pray about them and look for answers during conferecne. I did this and all of the questions were answered. It was carzy. 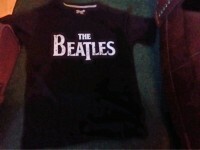 I will send a picture of the Beatles shirt next week since I'm in Gillette right now and my shirt a 1 1/2 hour drive away. I can wear the shirt in 22 months. That's right, it's already been 2 months as of today. Here's a picture of my hammer. Bang! Bang! Campbell's Silver Hammer! (Hopefully it doesn't go on anyone's head! Today is John Lennon birthday. He would be 77 today. This week has been crazy. I've had 3 different companions this week. Monday: We chilled in Gillette and said goodbye to everyone that was leaving. Then we headed back to Sheridan for the YSA Family Home Evening activity. Tuesday: In the morning my companion packed up. Then we went to say goodbye to some people and do some last minute sight seeing. Then in the evening he was off to his next area. I had the Zone Leader from Vegas as a companion which was pretty fun. We were able to go to a lesson in the evening. Wednesday: My new companion and I went to get this old camera from the antique store that he had seen last time he was in Sheridan. He had some film for it, so we tried it out. We don't know if it worked, because he needed to get the film developed. Then in the evening we were split up and I got paired with my new companion. Thursday: My new companion and I went to do service at the Salvation Army a ND the Food Bank as per usual. In the evening we were able to attend institute. Friday: We contacted some referrals that needed to be contacted for a while. We had a lesson in the afternoon. In the evening we were able to meet with a recent convert from Moorcroft. She is down in Sheridan for college. Saturday: We went to a baptism for a little girl. It was a very spiritual experience. Then we went around and contacted attempted contact with some more referrals. We were able to get a book of Mormon to this guy that requested one. We set up a lesson with him for Sunday morning. We also met with a guy that the sisters found. Sunday: We taught this referral that requested a Book of Mormon in the morning. Then we went to church. It was powerful to hear everyone's testimonies since it was fast Sunday. After church we had Chocolate Waffles at a member's house for dinner. That's all for this week. Have a great day yall. I'll send another one next Monday. Also make sure to listen to John Lennon music for me back home to celebrate his birthday. So this week I heard Ringo's Oh My My in Wendy's. 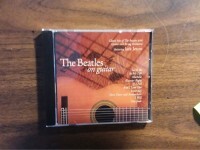 I also bought another Beatles instrumental CD from the antique shop. I now have the only two that they have. I've also been buying a few records from the antique shop in Sheridan and Gillette as we've past through and I've seen some cool things. Sadly I didn't think to take pictures of them before I packed them up to send home. But I'll tell you what I've purchased. I got a Billy Joel 45 for like 50cents(AKA the cheapest record I've bought that wasn't free) It was Honesty b/w The Mexican Connection. That's not one I feel like you'd see everyday. Interesting how the b side is a song from quite a bit before the a side. I also got a pack of 3 Beatles 45's I cant remember exactly what they were off the top of my head. 2 of them I already had, but they were on the red target capitol label(I think that's what it's called. It has the red outside circle and the orange inside circle). The other one I didn't have and it was on the orange and yellow spiral capitol label. The rest I got from an elder who bought records but then decided he didn't want to carry them around. I got them pretty cheap. I also got another copy of that Birth of the Beatles Italian album in worse condition than my other one. It wasnt in horrid condition though and I go it for $2. I think I'll probably sell it when I get home. 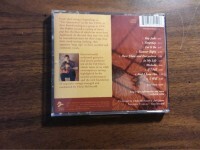 I also got an Elton John Album that I think Father Shears Campbell has, but I cant remmebr. 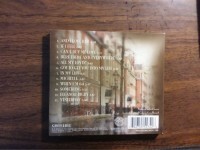 I don't remmebr what the album was called and I didn't recognize any of the songs on it, but it was in good condition. My dad has offered to work on my vinyl collection while I'm off on the mission. I gave him a list of albums I don't have and am looking for(basically all the Beatles/solo albums I don't have as well as a few albums from some other artists). I'm gonna have him sell that Elton John album if he already has it. He hasn't had a chance to go to the record store yet, but when he does I'll let you know what he's able to find. Monday: We went shopping for food and what not. In the evening I did the FHE activity. We made friendship bracelets. It was pretty fun. A lot of people enjoyed it. Tuesday: We met with the ward mission leader to discuss how work in the area is coming. He showed us an area that he wants us to tract out, so we planned to go there every Thursday. We also had a lesson with the investigator that is freinds with the YSA member. Wednesday: We went and contacted some people in the area book that I've never met. Some of these people my last companion has probably never met. One of these people had moved out and we found someone new at their address. Thursday: We did service at the Salvation Army and the Food Bank. That evening we gave a blessing to this girl in the hospital. Then we went tracting in that area the Mission Leader showed us. Then in the evening we had a lesson with the convert that was baptized at the beginning of September. Friday: We did weekly palnning, then we had a lesson with the lady we usually teach on Fridays. We went around looking for more people that were in our area book. Saturday: We went tracting a bit more in the area the mission leader suggested. Then we tried to contact some more people in the area book that weren't there when we went around the first time. Later we went to a member's house for dinner and ended up getting like 5 referals. Sunday: I gave a talk in the YSA ward along with my companion. Everybody seemed to like it. My talk was on following promptings from the Holy Ghost, and half of the talk was comprised of promptings from he holy ghost that I received while giving the talk. Half of the stuff I said I never wrote down or thought about saying before hand. I actually referenced the Beatles Bible in a personal experience. I said that I had a friend that had a list of stupid things that he did that you should never do(AKA Necko), and then my experience was a "stupid thing Billy Shears did that you should never do". I hope you guys had a great week. Tell me all about it. I'd love to hear how life is going for yall back home on the BB. Oh I heard a Beatles song today in Wendy's. It was Paul's "Junior's Farm". It was pretty sick. It also reminded me of home when the poker man verse came on. Another thing to add is that I received word from Father Shears Campbell on Thursday that the 45's got home safely. The LP's are supposed to arrive today, but I haven't heard anything from FSC about it. @sir walter raleigh, I sent you a pm with some news to pass on to WSC. Monday: We got an oil change on our car. During the oil change we biked to the church where we stayed until the oil change was complete. Then we locked our bikes on the back of our car and went shopping. We had Lunch with a YSA member and her parents. Tuesday: We had Zone Conference most of the day. Then in the afternoon we had a lesson with this guy who we met at third Thursday a few weeks ago. He is really interested in learning about our church. Then we had a lesson with that young couple I've mentioned before. It went pretty well. We were able to answer a lot of their questions. I also learned that they are gonna be John Lennon and Yoko Ono for Halloween AKA Nevada Day. Wednesday: We tracted a bit and found a lady who had met with the missionaries before. Then we read the book of Mormon with one of our investigators. It was a pretty awesome experience. Thursday: We did service for this guy to help him move stuff out of his trailer and into his storage unit, instead of going to the salvation army. He was so grateful for our service, and wanted to pay us, but I wouldn't let him. Then we did service at the Food Bank. In the evening we went tracting with this returned missionary from the second ward. Friday: Friday was busy. We had quite a few appointments. We taught like 3 lessons that day. It was pretty eventful. Saturday: We did a bit of tracting. Not much else happened on Saturday. Sunday: The 2nd ward had a primary program. Other than that it was a normal Sunday. I hope you all had a great week. If you ever want to ask me something, just shoot me an email and I'll get back to you on the next Monday. Also I heard Day Tripper playing in this local Cafe place. At least they will have a bag for their sweets if they dress up as John and Yoko! Monday: We did our shopping then hung out at the apartment until about Lunch time when we headed to Buffalo for Zone Preservation Day. We hung out and goofed around until about dinner time. Then I went to Gillette with The Zone Leader from Vegas and One of the new zone leaders. The other Zone leader and my companion went to Sheridan. There are 3 Zone leaders becuse the one from Vegas is going home on the 31st(AKA Nevada Day) He has completed his 2 years out here. Tuesday: We had like 6 lessons planned but all of them fell through for one reason or another. We ended up going tracting in this one area and we had quite a bit of success. In the evening We went on splitz. I went with The other zone Leader and the zone leader from Vegas went with this guy in the ward. We went to give a blessing to this guy who was a member growing up, then became antimormon, and now wants to come back to the church. Wednesday: We had district meeting. It was The zone leader from vegas's last dictrict meeting, so get did an activity with us where we wrote letters to ourselves that he will send to us when everybody in that room has returned from their mission. After that we had a lesson with this guy who came to church last week. We then went to contact a list of referrals that we were given. Thursday: So it snowed in the morning a little, and then it all melted by like 10:00 in the morning. I did build a pretty sick snowman that was like 3 inches tall. I feel like I'm destined never to see snow in this 2 years despite where I am. According to the locals, it usually is super snowy by now. If I don't get to see snow I'm gonna be pretty disappointed. We did service at the Salvation Army and the Food Bank, as per ussual. We had dinner with this family who is all memebers except the dad. However the dad goes to church every Sunday, reads the scriptures, prays and according to his wife is "basically a mormon". The only thing is he isn't baptized. After that we went and had a lesson with this lady that we tracted out last Wednesday. Friday: We helped the family that we had dinner with the previous night rake their yard and put the leaves in a trailer to take away. After that we helped the food bank set up this silent auction dinner. Then we helped vacuum up the church. We had a lesson with the lady we have the lesson with pretty much every Friday in the afternoon which was short because she had to go to a dinner later. After dinner we were able to go visit this one investigator we met last week. We scheduled a lesson for the next day. Saturday: We had a lesson with that recent convert that got baptized at the beginning of September in the morning. In the afternoon we had the lesson we set up the previous day where we read from the Book of Mormon and bit and talked about forgiveness. After that we went to the Trunk or Treat Chili cook off and looked for investigators. Sunday: We had church. Sacrament meeting was about family history work. We had the same 2 speaker giving the same 2 talks for all 3 sacrament meetings. Then in the YSA Branch we had a class on doing Family History Work, which I can actually do out in the feild. These weeks seem to go faster and faster as time goes on. It seems like just yesterday I was typing my week 13 weekly. Monday: We hung out at the appartement most of the day. In the evening we went to the YSA activity. We carved apples instead of pumpkins for the activity, because apples are cheaper than pumpkins. Mine was pretty sick. It had a face on the front, ears shaped like Nevada, and an NV on the back. Tuesday: NEVADA DAY!!! In the morning we went with this YSA member to his ranch to help him pound some posts(I also got to feed one of his cows). He is a returned missionary that got home like a month and a half ago. A lot of our lessons we scheduled fell through due to people not realizing that today was Nevada Day. I got a haircut though. In fact I got quite a few of them cut. Pretty much all the ones I own. At 6 we had to be in our house or a member's house, so we picked up a pizza from Little Ceasers and chilled in our appartment for the evening. Thursday: We didnt really do much on the exchange because the district leader ended up getting a horrible stomach ache and was bed ridden. At around 5 we ended the exchange and My companion and I went on splits with the young men. I went with one of the boys to visit an investigator of ours. He ended up not being able to meet with us due to a last minute emergency he had to attend to. My companion and the other boy went tracting. Friday: We met with a couple investigators. We went to the first lesson with a member in the YSA Branch who's one of the coolest people ever, and is probably the best member missionary ever. At the other one we were able to answer some of the investigator's questions that she had. Saturday: We went and juged this boat racing competition that the cub scouts did. It was like the pinewood derbys, but with sail boats, and you had to blow them along a stream of water. We juged the artistic awards, as well as the winners of the races. Then we got a call from one of the bishops who told us about a lady that had been in a car accident and wanted a blessing. We went and helped her out and gave her a blessing. Sunday: We had our normal 3 sacrament meetings. It was fast Sunday and so we got to hear a bunch people be their testimonies. I actually bore my testimony in the YSA branch. Then we had the break the fast dinner with the YSA members. That was my week. I hope you all had amazing weeks. This week I heard John's "Whatever Gets You Thru The Night " at Wendy's on Wednesday. Then at the break the fast the brach president's wife was playing Elvis Prer on the stereo, and I heard his version of Long Tall Sally which the Beatles also covered.